I promised myself when I started this blog that I wouldn't write about not being able to write. However, I haven't been able to write for awhile for a reason that has to do with collecting, in a way, so I'll explain more soon. 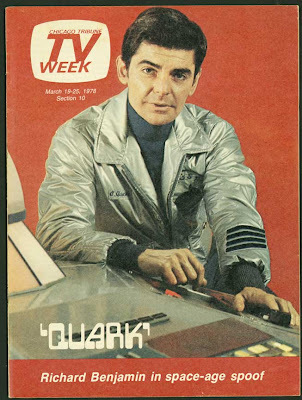 In the meantime, please enjoy this TV Week with a cover of Quark that I picked up awhile back. The article inside quoted Buck Henry as saying Quark was meant to do for Science Fiction what "Get Smart" did for the spy genre. And it did, just not for very long. "The World's Largest" is a joke I use for when I collect something incredibly, incredibly obscure and imagine no one else in the world has even bothered to put two items together. Please note I'm aware that most likely there is a larger collection out there somewhere. That has nothing to do with the joke and I'm not trying to get nto the Guinness Book. It's more to the point that I'm collecting something fairly obscure. Like, for example, my World's Largest Collection for "Carpoolers," the short-lived ABC show from last year: this air freshener, and a single episode still saved on my Tivo. I really grew to like that program. Why do all the best TV shows seem to have less than 13 episodes? After stopping by the Melrose Trading Post looking for Restaurant Row memorabilia (but instead finding this great historic photo), I went down to Santa Monica to check out an antique mall I hadn't been to in a few years. It is still there and was packed with tons of tiny items of interest to me, squirreled away in the shelves and tiny drawers of about 200 dealers stalls. If you're a collector, often it's the hunt that is the most fun, and that afternoon, I was in the mood to go over the place with a fine toothed comb. I was probably there at least 2 hours, and found many, many great items. 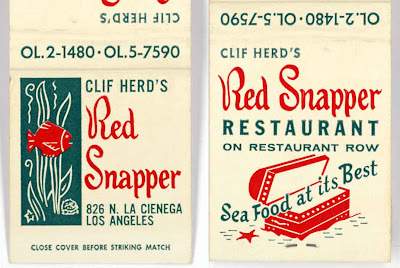 Like the matchbook for "Clif Herd's Red Snapper" on Restaurant Row, above. As you can see, it's the same address as the Lobster Barrel - 826 La Cienega. From the graphics I'd say this was in the late 50's or early 60's - just a guess - and sometime after it was "The Famous Restaurant." I have no idea who Clif Herd was, but apparently he also had a Red Snapper restaurant in Monterey Bay (at least according to this auction). A curious feature of Ebay for the masochistic collector is that you can search completed auctions too. 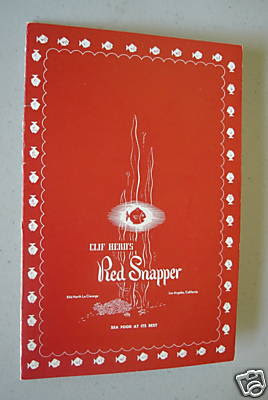 Though I found nothing currently offered from the Red Snapper, a completed search showed me that a mere couple weeks before I learned the place existed, another collector bought the menu above, unchallenged, with a bid of 10 dollars. Well, at least I swiped this scan of it from the auction for free... but as I've said before "virtual" collecting isn't quite as satisfying as the real thing. SPOILER ALERT: If you've been reading along here, you may have noticed this is not generally a "spoiler" blog: visiting recordings of "The Big Bang Theory," for example, I went out of the way to not comment on the episode details until they aired. 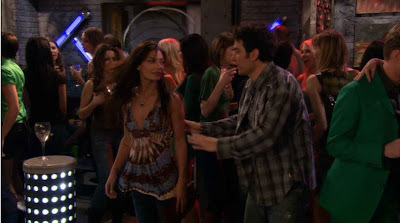 On "How I Met Your Mother," however, I believe it's fair game to share my speculation that the "Mother" mentioned in the title has been "Met,"on the show, by main character Ted. I have I had been told by a producer of the show or such that yes, my theory here is true, I wouldn't be printing it. Sharing speculation is part of the fun of enjoying a show; sharing insider information to me ruins it. Luckily in this case, I don't know any of the creators of How I Met Your Mother. However, if you don't want to read my theory on how the show will play out, don't read on. Ok. 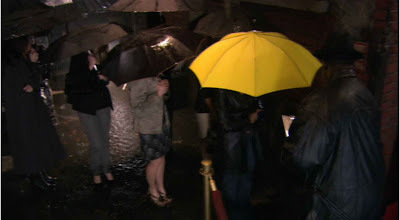 It was established very early in the 3rd season (now available on DVD) that the "short version" of the story of Ted meeting his bride-to-be is "that thing with her umbrella," and establishes that she carries a unique yellow umbrella. Next, in the episode "No Tomorrow" it is established that Mom is at a St. Patrick's Day party Ted attends, in part by showing the yellow umbrella on line. Ted says they didn't meet at that party, but if he hadn't gone, they might not have ever met. 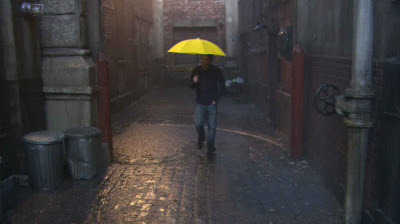 So, we can guess that at some point in the future, Ted will use the yellow umbrella, and "Mom" will confront him or some such, love at first sight, series over. She says "That's okay," gives him a very brief once over and moves on. Is this Mom? I think so. When you're telling a story in 22 minutes, you don't waste a moment on anything unnecessary. And when you pay actors more to speak than not, you don't give them a line when a smile and a "no problem" nod would suffice. That's why I believe this innocent little encounter is a nod to a character to come on the show. Usually I end up writing about collectibles here, but "How I Met Your Mother" is a rare case of a show I'm just a fan of - at least so far, I have the DVDs, but I'm not seeking out autographs, posters, or books from the program. 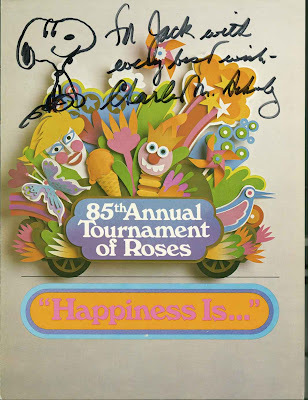 Just in time for New Year's Day, this is a program from the 1974 Tournament of Roses Parade, signed by the Grand Marshall that year, with a sketch of a little character he was known for drawing. Jack Whitehead was an official with the Tournament for some time - I can't find any details about him - but several years back he decided to sell a lot of his memorabilia, through a friend of mine, including this program signed by Charles Schulz along with a photo of Jack and Charles together. The Snoopy rode in the car with him. 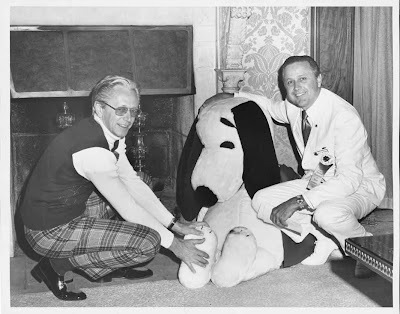 You can see a photo of Schulz during the parade, as well as (at least just about) the only self-referencing Peanuts strip Schulz ever wrote, on the Charles M. Schulz museum's timeline page for the 70's here.